The smart design of our flagship model MX 99 offers the finest in water technology that includes a large-sized liquid crystal display notifying the user of the water being produced: A2O® alkaline water, acidic water, strong acidic water, strong alkaline water or clean water. The large sized electrolytic cell can produce A2O® alkaline water at 0.92 to 1.85 gallons per minute and Strong acidic water at 0.13 to 0.26 gallons per minute. The system can generate water with ORP ranging from +1130MV to -800mV, giving its powerful cleaning and antioxidant properties. The microcomputer system monitors water flow rate and filter cartridge usage. Different levels of A2O® alkaline water and acidic water can be selected with just a simple touch of a button from the color coded control panel. Life is made easier with the automatic cleaning feature--the system is programmed to periodically clean the electrolysis chamber maintaining the highest level of performance. By process of electrolysis, MX 55 can continuously produce ionized water of various pH levels suitable for many applications. The three platinum coated titanium electrode plates of the MX 55 model mean the system is highly efficient with superior processing capacity. The three types of water can be easily selected with the magnificent one-touch panel operation. The automatic self-cleaning electrolysis chamber maintains the highest level of performance. The system is equipped with three-layered, high powered water cleaning filter creating delicious water. Its advanced technology and ionization process not only changes traditional H2O but it improves on its health value. AYRO AG is the first and only system able to use (RO) or pure water to produce Antioxidant Water. Through patent-pending, proprietary technology, AYROTM AG is versatile enough to be used in conjunction with a household reverse osmosis (RO) filtering system. AYROTM AG significantly boosts the health profile of water, enhances mineral and antioxidant content. By drinking Antioxidant Water from a mineral-rich source - like the AYROTM AG, your body will begin to function efficiently once again, as the problems resulting from the consumption of pure water naturally correct themselves. Through a proprietary technology with advanced five-stage filtration process, AYRO HT generates clean and great tasting water while filtering out harmful chemicals from the tap. First, regular tap water is filtered through a mechanical filter reducing sediments. Then, water passes through the granular activated carbon filter, KDF media and 0.5 micron carbon block which reduces odors, impurities, chemical contaminants, bacteria and microorganisms for clean and great-tasting water. Created from cutting-edge technology, AYRO HT is an economical alternative to bottled water that is perfect for your home and office. It is also small enough to travel with and easily connects to virtually any hotel room faucets. The Pure Spa mineral ion water activator delivers the same water as the world famous Futamata Radium Hot Spring in Hokkaido, Japan. The Chikutan ceramic ball are made from Tufa, Power stone, and MIC stone that promotes metabolism, improves natural healing power and normalizes the autonomic nervous system. A mineral stone formed by depositing crystals of Calcium Carbonate, which is an ingredient of the Hot Spring. The mineral content improves overall physical condition, enhances heat regulation with calming effects. Naturally activated Power stone generates a high level of far-infrared radiant energy and negative-ions. It releases 30 times more negative-ions than the natural Tourmaline stone. Made up of more than 25,000 different minerals, it purifies the water by absorbing toxic substance and regulates the water quality. Think Alkaline shower filter effectively removes 90-95% of the free chlorine every time you shower. Its specially formulated KDF media is highly efficient with superior chlorine removal capacity. The crystalline quartz technology softens the water and delivers an energy-enhanced shower. "Have Healthy A2O® Water Anywhere"
At Thinkalkaline® we continuously strive for sustainability and a green environment. Take your A2O® Water everywhere you go with the reusable and durable BPA-free bottle that is good for you AND the environment. Test chlorine level in tap and potable water. 15mL. Water pH reagent liquid suitable for testing tap and potable water. Place a few drops of the pH liquid to test your tap or drinking water pH level. Check results instantly with the color chart (pH 4.0-10.0). 15mL. Think Alkaline’s new lead-free brass faucet eliminates the white diverter attached to the kitchen faucet, and the white hose that runs across the sink. It comes in chrome finish. CONVENIENT, AFFORDABLE & EASY TO INSTALL! New! Designer Faucet Installation Kit. It includes ½″ NPSM x ½″ NPSM x 3/8″ tubing faucet valve adapter, quick disconnect fitting and 4ft 3/8″ tubing. High-grade calcium supplement specially formulated for use with water ionizers. 15g. Advanced multi-stage 5 micron rating carbon block filter. New technology with highest grade coconut shell carbon removes chlorine and odor for clean and great-tasting water. 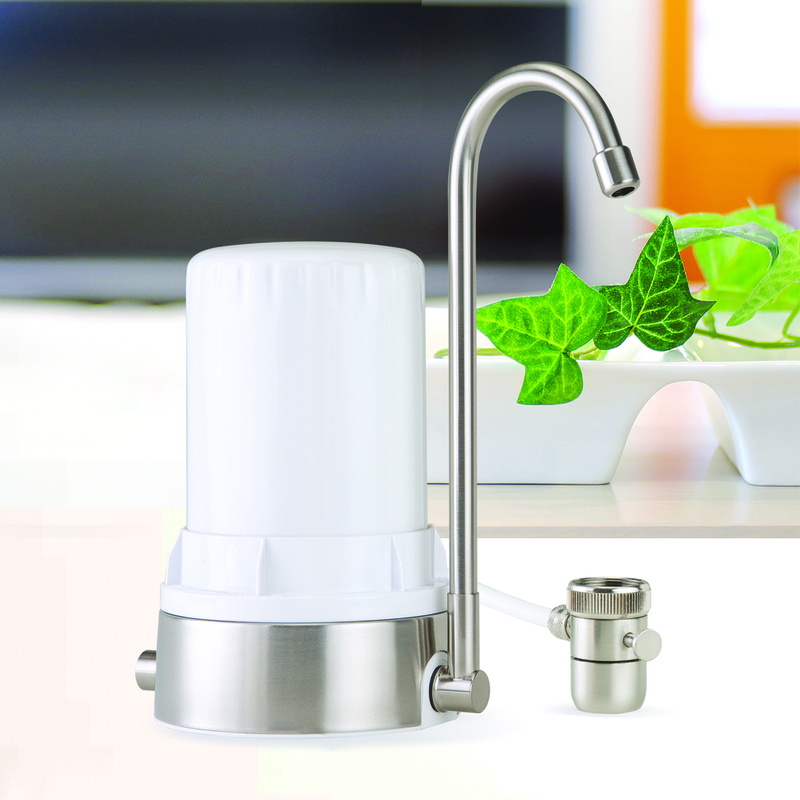 Specially designed for Sanastec and compatible with most Enagic and Toyo water ionizers. Recommended replacement every 6-12 months. Made in USA. Advanced multi-stage 2 micron rating carbon block filter. New technology with highest grade coconut shell carbon, KDF media and proprietary materials effectively control build-up of microorganisms (bacteria, algae, fungi) and maximum reduction of water contaminants including: chlorine, odor, organic chemical compounds (household chemicals, pesticides), total organic carbon, and heavy metals (lead, mercury, nickel, chromium). Advanced multi-stage 0.5 micron rating carbon block filter. New technology with highest grade coconut shell carbon, KDF media and proprietary materials effectively control build-up of microorganisms (bacteria, algae, fungi) and maximum reduction of water contaminants including: chlorine, odor, organic chemical compounds (household chemicals, pesticides), heavy metals (lead, mercury, nickel, chromium), parasites (Cryptosporidium, Giardia) and Cysts. AF-9000CC- cleaning cartridge is compatible with all Sanastec, and most Toyo and Enagic water ionizers. Use of cleaning cartridge at least twice a year to maintain performance and extend the life of your ionizer is highly recommended. Holds 3 times more of the cleaning granule than E-Cleaner to get better cleaning result. Use only Crystalline Cleaning Granule for Refill (AF-CCG). Specially designed for Leveluk Series new HG-N filters. Recommended replacement every 6-12 months. Made in USA. Specially designed for Leveluk Series HG-N filters. Recommended replacement every 6-12 months. Made in USA. AF-9000CC-HGN cleaning cartridge is compatible with all Sanastec, and most Toyo and Enagic water ionizers. Use of cleaning cartridge at least twice a year to maintain performance and extend the life of your ionizer is highly recommended. AYRO's advanced multi-stage filtration comes with the highest grade coconut shell carbon and high capacity chlorine, taste and odor reduction that delivers clean, great-tasting antioxidant alkaline water. The uniquely high antioxidant alkaline water also helps counterbalance daily acidic diet and stress, neutralizes free radicals released from your body, and delivers faster hydration compared to other beverages. Recommended replacement is every 6-12 months. AYRO's advanced multi-stage filtration comes with the highest grade coconut shell carbon and high capacity chlorine, taste and odor reduction that delivers clean, great-tasting alkaline water. Recommended replacement is every 6-12 months. AYRO's advanced multi-stage filtration comes with the highest grade coconut shell carbon and high capacity chlorine, taste and odor reduction that delivers clean, great-tasting water. Recommended replacement is every 6-12 months.